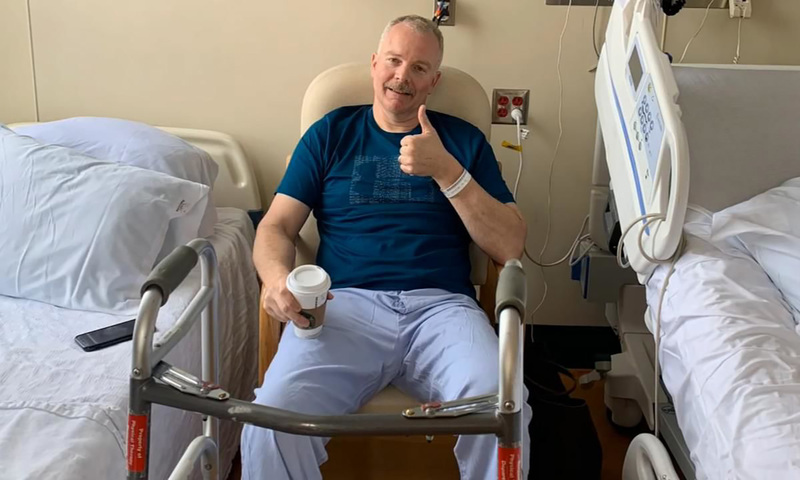 PORTLAND, OR (KPTV) – A Portland police officer is recovering from serious injuries, after police said he was hit by an intoxicated driver while working on I-205 one week ago. This is actually the second time in five months that Officer Mark Gaither was hit while on duty. His wife, Jennifer Gaither, said he’s doing well, recovering at a rehab facility in Medford, but that this has been hard on the whole family. “That crash to me did not look like survivable,” Jennifer said. She’s looked at the photos of her husband’s crumpled patrol car so many times. “When the day gets hard we just think we have him and he’s alive and we’re just blessed,” Jennifer said. Jennifer told FOX 12 he suffered fractured ribs, a fractured femur, a dislocated hip and possibly a concussion from the crash. And after being hospitalized in Portland, he was just transferred to a rehab facility in Medford. He and his family recently moved to Grants Pass. But it’s not just this accident that’s shaken them. There’s been two like this in the past five months. Back in November, Officer Gaither was on his motorcycle on I-84 when he was hit by a man who police say was driving drunk. “It’s unbelievable but it really does show the need for traffic enforcement in the City of Portland the amount of inebriated drivers on the road is staggering,” Jennifer said. And because of that, Jennifer said as soon as he’s able to, her husband wants to go right back to work to stop these dangerous drivers. She said their biggest hope is that what’s happened to him can prevent future crashes. “If this accident reaches one person and they make that decision tonight tomorrow in the next week to not drive drunk then in my head it would be worth it,” Jennifer said. They don’t know how long he’ll he be at the rehab center but Jennifer said he has months of recovery ahead. A GoFundMe was created in support of Officer Gaither.